Hillside, NJ – May 14, 2018 – WizKids is excited to announce a new game that puts the Fun in dungeon, Fungeon Party! 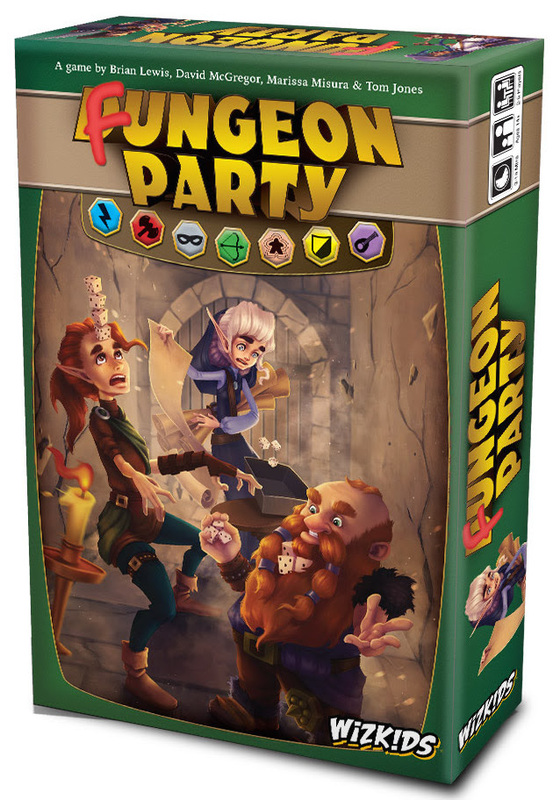 Designed by Brian Lewis, David McGregor, Marissa Misura, and Tom Jones, this is a fast paced, quest completion game which takes a traditional dungeon party and puts them in a truly untraditional dungeon crawler. 2 to 5 players pick a class from a list of classic adventure choices; such as Barbarian, Cleric, Ranger, and Wizard, just to name a few. Each class has their own stats, which can be upgraded as experience points are earned, as well as a special ability that will help the party complete a pile of at least 6 quests. What types of quests would you expect in a Fungeon? Stack dice on your forehead, bounce dice into the box, knock down a meeple surrounded by dice, balance a meeple on a stick. These, and many more wacky quests await the brave adventures that travel through the corridors of a Fungeon!